Ughhh…how many times have you spent the month of December unbuttoning the top button of your pants, bemoaning your lack of self-control, and feeling nauseous from too much wheat and sugar? Good news – it doesn’t have to be that way! Knowing why we tend to eat so much during the holidays can keep us from overindulging. 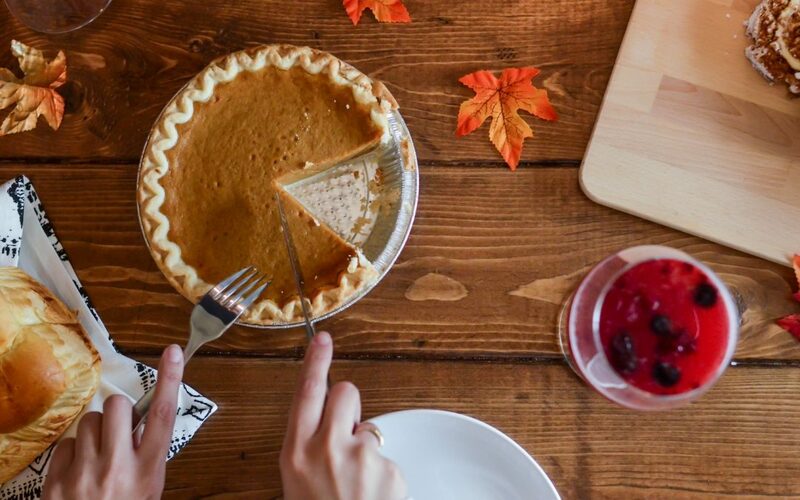 Here are three little-known reasons we overeat during the holiday season, and my personal troubleshooting tips for each one. Let me know which ones you find helpful in the comments below. 1. Not enough “me” time. Most of us have little enough “me” time day-to-day as it is! Between work, family, sleep, and social life, there’s just not a lot left over for RnR. During the holidays, with increased social and family obligations, it becomes even harder to steal ten minutes for a relaxing bath, or even five minutes for some deep breathing. When we ignore our need to relax, our insides start to mutter, then complain, and then, to yell. And some of us have the tendency to turn to food (or alcohol) to medicate that noise, instead of giving ourselves what we really need. My suggestion: take a look at your schedule in advance and schedule time to decompress. Knowing beforehand that you’ve blocked out 30 minutes here and there for a walk or meditation can help soothe that part of you that needs to chill. Take a stroll around any major shopping center between Black Friday and Xmas eve and you’ll feel it. Xmas carols blasting! Little children screeching! Parents exasperated cause they can’t find the toys their screechers want! You may feel overwhelmed by your schedule, or by the amount of money you’re spending on gifts. Once again, cookies and alcohol are there to quell the stress – but we all know that’s a temporary measure. My suggestion: don’t overcommit, and try not to go places that you know are going to have you tearing your hair out. Do malls make you nuts? Do your shopping online, or visit mom-and-pop stores that feel more manageable. Got too many parties on the calendar? You popular lady, you – now, choose the three that you actually want to go to. The holidays are also stressful ’cause of all of the expectations that go along with this time of year. There’s this image of a perfect, blissful family gathered around a crackling fire, feasting and laughing. And while that’s the case for some fortunate folk, for many of us, the holidays bring up feelings of loneliness, sadness, and even anger. If we’ve internalized this idea that we’re supposed to be having some Norman Rockwell Christmas, that can make our already negative emotions even worse. Once again – latkes and Yule logs to the rescue. My suggestion: take a clear look at any disappointments and frustrations you may have about the holiday season. Acknowledge them and feel them. Cry and yell if you have to (you’ll feel better afterward). And then identify some things that you’re actually looking forward to. There’s always something good to connect to. Pretty decorations…being cozy inside…walking in the snow…cheesy holiday music…identify what you enjoy about the season and incorporate these things to the fullest. Remember that your life’s your own, so you can create a holiday season that supports what you need.